As the Barrows look back on our year, a lot has changed! Adrienne Louise Barrows came to us February 3 and we have been blessed to have such a good baby! We have just loved being parents and are looking forward to what the future holds for us! Jamie just started his 3rd year at Columbia Sothern University in November. He has been making the long drive to Orange Beach, Alabama (work) and back to Milton, Florida (home). He carpools when he is able to, so that cuts back on the cost. He is a software engineer and has been really enjoying his work. Sometimes he has long hard deadlines to meet but other times it’s a little slower. Though there is never a time where he has nothing to do! Jamie is involved with our church by occasionally leading our Bible Study when our leader is out of town. Kierra is still at home with Adrienne. And time is flying by! There is always something that needs to be done around the house and there is never a time that she has “nothing” to do. She enjoys every moment of being a mom and being able to be home with Adrienne everyday! Adrienne does keep her busy especially now that she is more mobile! Adrienne…well she is growing up so fast! It is hard to believe she will be one very soon! She loves to play with things she is not supposed to have…such as cords, dad’s computer, the TV remote, & eating plants! Her favorite is getting into the cords to play! Jamie lets his girls travel since he is unable to get a lot of time off. During the summer the girls had the opportunity to travel to Indianapolis, Atlanta, Norfolk, Suffolk, Lynchburg, & Dover to visit family members. In August, the whole family went to Ohio for a Taaron (Kierra’s brother) & Tiffany’s wedding in August. This put our traveling to an end until Christmas. As the year comes to an end, we are thankful for God’s greatness to us. We look forward to hearing updates on you & your family. 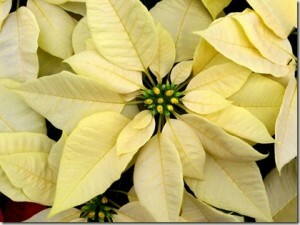 Have a Merry Christmas and a Happy New Year! 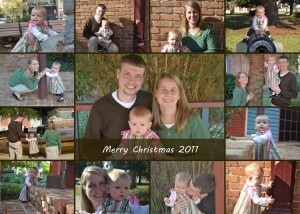 If you want to see all the family pictures we took for our Christmas card, check out this link. On Wednesday, February 02, 2011, I was just one day past my due date. I got up and did some laundry because, kiddingly I thought, I did not know when I would be able do laundry again. For breakfast, I had a bowl of cereal and my usual banana. As I was putting the laundry away, I felt a leakcalled for my mother and asked her what was happening. She was not quite sure at this point but was glad that I was going to see the doctor that day. I also decided I would eat lunch after my doctor’s appointment because it would not be all that late. I went to my scheduled doctor’s appointment at 1:00pm. I had an ultrasound and all of the results came back good. I still had enough amniotic fluid, and the baby was still healthy. Dad and I finished with the ultrasound at 1:30pm and waited in the waiting room until 2:00pm for my appointment, at which time they measured my blood pressure and weight. Then, I had “mat time” with my doctor, Dr. Sharon Seidel. I told her I needed to speak to her about something right away. We stepped into another room just as she was called to check on something else. When she returned to the room, I explained to her what was happening to me. She asked me if I wanted to be checked out and, of course, I thought this was the right thing to do. Dr. Dawn Stanley, my other doctor, asked me to go to a room where she could check me. At this point, I was out of control!! I told her there was no possible way I could take my shorts off without making a mess. She assured me that was all right and told me to do my best. Well, I ended up making a big mess of the room and my clothes! Dr. Dawn checked me and said my water had broken, and I was dilated to 1cm. Dr. Sharon and Dr. Dawn got my paper work together and admitted me to Labor and Delivery at the Sacred Heart Hospital in Pensacola, Florida. On the way across the street, we called both of our mothers to let them know I was going straight to Labor and Delivery. Shortly after talking to them; Grandma Long, Nana Barrows, and Aunt Anna Barrows arrived at the hospital, hoping to see a baby that night! We arrived at Labor and Delivery and were settled in our room by 3:05pm. They immediately hooked me up to an IV. They had a hard time getting the IV in. Finally after trying 3 times, they were able to put the IV in my hand. They put me on Pitocin immediately and then started the epidural after that. I quickly became numb. After which I was unable to get up and move around, including using the restroom; so, they put a catheter in me, which in a way was really nice, because then I did not have to get up five times that night to go to the restroom! Of course, I also had the baby hooked up to a monitor, me hooked up to another monitor, and a machine taking my blood pressure every hour. After administering the epidural, they decided I needed to roll onto my right side, hoping this would help me to become dilated faster. Shortly after moving me to that side, the monitors showed something the nurse didn’t like. Suddenly we had five nurses and a doctor in the room trying to figure out what would be best to do next? The baby’s heart beat had dropped way too low! They immediately moved me back onto my back and the baby calmed down. About an hour or so later, they decided to try again, but this time they turned me to my left side and there was no problem. All night long they rotated me from my back, to my left side, to a sitting position. It was a long night! I asked the nurse what time would she guess that the baby would come, and she thought maybe around 5:00am, or so? Since we then realized that we were not going to be having a baby very soon, we sent our mothers home and told them we would ask them to come back when we knew a little more. We talked to them throughout the following day, keeping them informed of our progress. Through out all of this time, I was only able to eat ice chips and nothing else because of the epidural. By 11:00am on Thursday, February 03, 2011, I was dilated to 8cm and was getting closer to delivery. Around 2:40pm, I called for my nurse to come to my room because the epidural medicine had worn off. I told her prior to her leaving my room, and she said she would take care of it when she could get back, in about ten minutes. She took a long time coming back because her other patient was in labor, too, and she was needed to help with her. Eventually, I pushed the button for a nurse, and she came immediately and gave me some more medicine. That nurse also checked me. She said I was at 10cm, and I was going to be delivering my baby at any minute. They prepped me for delivery, had me practice pushing one time, and then checked me once more. At that time, they realized I was really still only at 8cm.! Very soon, all of the doctors and nurses arrived who needed to be in my room for the delivery of our baby. They decided to give me another hour to see if I could dilate to 10cm before making the final decision to perform a c-section. At 4:15pm, the doctor returned and there had been no change. They began prepping me for a c-section—increasing the epidural medicine, taking a last blood pressure check, and making sure everything on the baby was looking good. They asked Dad to put on his outfit there in the room—a body suit, shoe coverings, a hat, and a mouth/nose guard. They unhooked me from any cords and wheeled me in the bed to the Operating Room. By the time I arrived in the OR, I was shivering uncontrollably. They laid some hot blankets on me to try to help me get warmer. That helped me stop shaking some but once the blankets cooled down, I began shaking again. They asked Dad to leave the room so they could sterilize everything in the room before the operation. They put up a blue blanket to block my view from seeing them operate on me. The doctors allowed Dad to come back into the OR, making sure he did not touch anything. He was asked to sit in a chair by my head, and neither one of us could see what was happening. Both of my doctors ~ Dr. Sharon Seidel and Dr. Dawn Stanley ~ were able to be there to operate on me. Following checking me and making sure I was completely numb, they started the process of delivering our baby. As soon as Adrienne Louise was out, they lowered the curtain just enough for Dad to see you, but I was still unable to see anything. After cleaning you up a little bit, they laid you beside me, but I was not able to really touch you because of the position in which I was lying. Very soon, they took you away to measure your weight and length. Next, you were cleaned up and Dad was able to hold you. Because you were a c-section baby, you still had some fluid in your lungs. They gave us a suction to get the extra saliva out of your mouth whenever you had bubbles. The doctors soon noticed that there was quite a lot of fluid in your lungs, so they took you from Dad to get it allsuctioned out. Dad left the room and went to the recovery room, stopping by the newborn window to look at you while waiting for me to be finished being stapled. I arrived twenty minutes later, but at this point, you were already gone. I stayed in the recovery room for an hour, and then I was taken to my room. It was another half hour before they finally brought you back to me. This was my first time holding you. Adrienne Louise Barrows, you were born at 5:09pm, on February 03, 2011. You weighed 7lb and 7.4oz and were 21¼ inches long. We thank the Lord for you and love you so very much! Kierra convinced me to sign up for a Netflix account last month. Aside from the DVDs in the mail every week, it also has a great instant watch feature. So a lot of movies and TV shows are available to be watched in a browser on your computer. Which is really nice, except for the whole having to be on the computer thing. So I did the typical geeky thing and hooked up a computer to my TV. And it worked great. 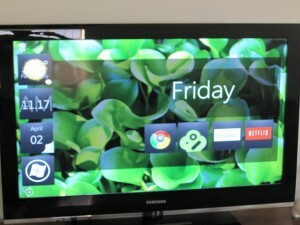 Now I could watch all of the things available on Netflix, as well as current TV episodes on Hulu. The only problem is that the PC I used was an old one. And it looked awful in my living room. The huge Desktop stuck out like a sore thumb and totally ruined the look of the room. I didn’t really want to spend any money on a new desktop that would look better (Though Dell has some nice looking ones). And I didn’t want to just leave the PC in the living room looking ugly. At the same time I didn’t want to give up being able to watch Netflix and Hulu on my TV. So I decided to make my own case. I bought a decorative chest (You can find them at stores like Hobby Lobby and Michaels) that would match the room and cut the appropriate holes in the back for ventilation and port access. Then I gutted the PC I had for parts. Putting everything in the chest. It’s a little cramped, but it all fit and the ventilation is working to keep it from overheating. Ended up modifying a doorbell switch as a new power switch, and even cut a hole and mounted the DVD drive out the side. The end result is a decorative chest that sits on the shelf under my TV. And best of all, it doesn’t look anything like a PC. Oh, and then I went ahead and installed a custom RainMeter skin for the PC. Which gives us a clean interface that we can run from across the room. With a wireless mouse and keyboard, or an iPhone app I can easily run the whole PC. Anyway, all in all I am pretty pleased with the result. Click Through if you can’t see the pictures. 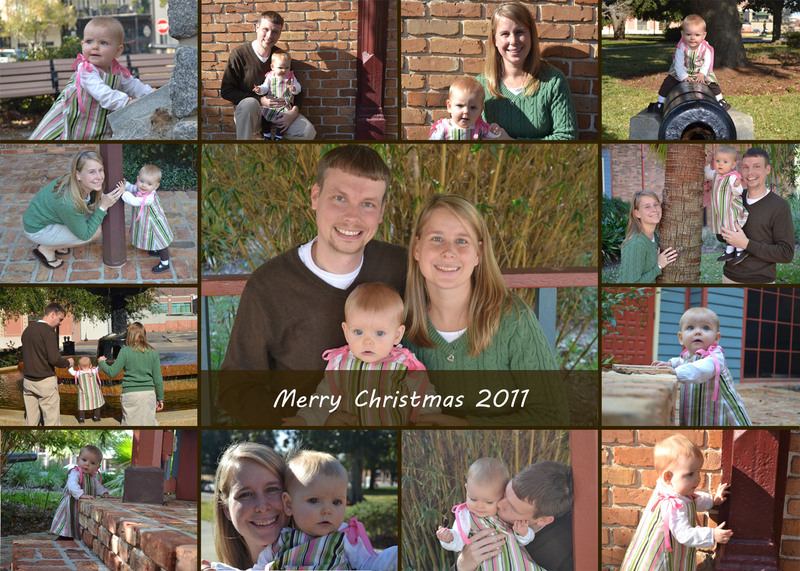 This was our first Christmas together after being married. Jamie had the whole week off and also was able to get the following week off as well. Jamie and I decided to open our gifts on Christmas Eve since we knew we were going to have a busy day on Christmas. And we would be traveling the following week. Christmas morning we spent over to the Barrows’ house exchanging gifts with the family. Afterward, we watched a movie and had dinner. Later that evening we had met up again and played card games. On Sunday we drove to Atlanta to catch our flight to Frozen Tundra of the North (AKA Ohio). We made our connection with no problems at all. And the flight was uneventful. When we landed we were greeted with an inch of snow and more coming down. It’s about a 45 minute drive to the Long family home. So the continued snowfall was a bit of concern. But made it safely and thankfully we were in a 4 wheel drive vehicle. So despite the snow, we were able to drive up the driveway. Otherwise, we would have had to walk all the way up in the snow. There were many activities planned for the week and the whole family trickled in over the next few days. Each day it snowed a little more. On New Year’s Eve we exchanged gifts and then sat around and visited with each other. Later we played with the nephews until it was time for the ball to drop. Jamie and I had the privilege of staying up with our nephews Landon (5) and Layton (3) to bring in the 2010 Year!! The next day was the Traditional Christmas Dinner with the Long family and Mr. Keith. Saturday everyone headed out. Each going their separate ways back to their homes. We drove from Ohio to Atlanta on Saturday and then Sunday we headed back to Florida looking forward to warmer weather. When we arrived here we found out it was going to be a cold week and every day it was to be below freezing at night. So I guess the cold followed us home. This year was our first Thanksgiving together as a married couple. And it turned out to be a pretty big event. The meal was eaten at my parents house and we needed two whole tables to fit everyone. We had lots family over and even some of Emily’s (my sister) college friends over for the big meal. Along with this being Kierra’s first Thanksgiving with my family it was also my Uncle’s wife and two daughters first Thanksgiving ever. We had a great time getting together and enjoying one another’s fellowship. 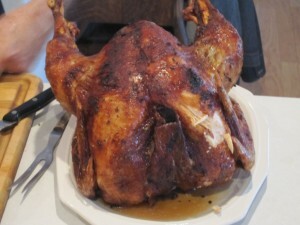 For the meal we had three different turkeys –smoked, fried and traditionally oven cooked turkey. As well as all the mashed potatoes, stuffing, and veggies we could eat. After the meal we all got together and played phase ten and Nintendo Wii all while eating home made apple and pumpkin pie. The festivities lasted late into the evening. Just before we got married Jamie remodeled the master bedroom and bathroom. That took a lot of time. Mainly because he was working a full time job and could only work on it on the weekends and at night. But it turned out really nice and we are both very happy with the way it looks. That was all Jamie was able to get done before I moved my stuff into the house. Since we have been married we have been enjoying our time together and taking the decorating and remodeling slowly. Jamie works at Columbia Southern University and I stay home and keep up the house. We have been steadily fixing our house the way we want it, but it takes a lot of money and time to get what we want. 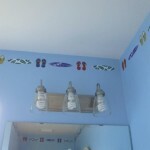 Recently we finished the remodeling and decorating of the downstairs bathroom. You can check out the pictures here. In the past month we have been traveling a lot to see my family. 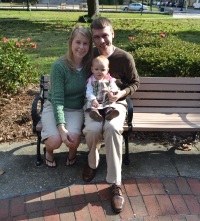 We went to visit Tavis and Kendal in Camp Lejeune, North Carolina. They, Tavis and Kendal, had just adopted a little girl named Karsen. Also we went to visit Kaelah and Lew in Atlanta and carry on our tradition of having an Early Thanksgiving with them. It has been fun traveling and seeing everyone. That’s all for now. Keep checking back because I’m sure we will post another update soon.